Your attitude on the road affects your risk of having an accident, and also influences how other drivers treat you. It can be the difference between arriving angry and frustrated or arriving calm and relaxed. In this article we’ll go through a number of scenarios where your attitude on the road is important. Courteous driving is driving that helps other drivers drive with you on the road. It includes your road position (maintaining your own visibility to other vehicles, maintaining adequate safety buffers and positioning your vehicle so that other drivers know your intentions, and signalling clearly what you are doing and where you are using your indicators and lights), how you react to other road users’ manoeuvres and driving, and your adherence to the road rules. If you drive competitively and show off then you increase the risks for all road users. This is a leading cause of accidents in young drivers. If you signal ambiguously (this includes forgetting to turn off or cancel your indicator), then you put yourself at more risk. Patience is important. Some people won’t have the same skill levels as you and may drive more slowly or hesitantly than you want. For example, learner drivers could be overwhelmed with all the visual information they have to take in, while elderly drivers may have more difficulty reacting as quickly and therefore might choose to drive more slowly. If a long, heavily laden lorry or any other long vehicle like a bus or coach is taking a long time to overtake you, slow down and help it pass. If you are in a situation where the driver is making a safe overtaking move and has plenty of time to complete it, let the driver decide when to move back to the left. If you are travelling in a slow-moving vehicle such as a scooter or tractor on a narrow, winding road, pull over periodically in a safe place to let other drivers past. This also applies if you are out on a sightseeing tour and are driving slowly. If you are travelling at the speed limit and someone behind you wants to overtake, don’t prevent them from overtaking or you may encourage them to try to overtake you in a dangerous place. When on a motorway you must drive in the left lane unless you are overtaking. You can be fined for driving in the overtaking lane if you are not overtaking. Driving in the countryside means you are likely to come across animals like horses, sheep, cattle, deer and smaller wild animals. If a person herding sheep or cattle asks you to stop, follow their instructions. Animals can be unpredictable and startle easily. They will make their way around your stationary vehicle, then you can be on your way. When overtaking a horse and rider you should slow down and give them a wide berth. The size of your vehicle, its noise and the hiss of air brakes (if you are driving a lorry or bus) can startle them. Don’t use your horn, and turn your radio down. Pedestrians are harder than motorists to see in the day, and it’s even more difficult at night. The sign on the left is often used where there are people regularly walking on the side of the road. 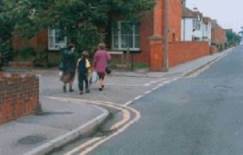 They may also be walking on the side of the road if the left lane or pavement is being repaired, or if it’s a country road without pavements (in which case they should be walking towards you on your side of the road. If you see a pedestrian wearing reflective clothing and carrying a bright red light it is an organised walk. The people involved in the walk should be keeping to the left, but this can’t be assumed. Pass slowly, ensuring that you have the time to do so safely. Be aware that the pedestrians have their backs to you and might not know that you’re there. If pedestrians are already crossing a side street that you want to turn into, you must stop and wait for them to cross. As you drive past a group of school children standing next to the kerb you should check your nearside mirror. On approach you should consider if you need to use the horn as a warning (this may not be appropriate where animals are around). Always check your nearside mirror as you pass potential hazards on the left. You should be aware of other dangers if you have to drive close to the kerb in an urban area (such as near a shopping centre): pedestrians could step off the kerb, cyclists could move up on your left and your nearside mirror could hit pedestrians. Take care and watch for pedestrians particularly around ice cream vans, mobile shops and main shopping centres. Children can dash out from behind ice cream vans as they have less awareness of traffic safety. If you are driving in wet weather and there’s a large puddle close to the left-hand kerb and pedestrians are close to it, avoid driving through it at speed. The effect of your vehicle driving through a puddle will be to throw water onto the pavement. If there are pedestrians close by they could be splashed with the water. Be considerate and, if it’s safe to do so. If you have stopped for an elderly pedestrian to cross and they can’t cross slowly, but this is holding up traffic behind you, resist the temptation to hurry them up. They may not be able to move any faster, or might have restricted awareness of traffic around them. Cyclists can wobble in strong winds so give them a wide berth. They may also stay to the left when they signal right if they don’t feel comfortable riding in the middle of the lane. Horses can be unpredictable and could turn in any direction. Drive slowly past them. If one of the horses becomes nervous, brake gently and come to a stop. A nervous animal is unpredictable, you should wait until the animal is settled or has passed by. Other road users behind you may have limited vision of the hazard, so good mirror work and early signalling will be required. If you have to pass a group of riders on horseback you must give them plenty of room. Try not to startle the animals, the riders might be learners and have limited control. Blind pedestrians will carry a white cane. If they are also deaf the cane will have a red ring. Deaf pedestrians may be seen with a dog with a yellow or burgundy coat. Disabled road users sometimes use electric-powered buggies with a flashing amber light. Disabled road users will find it more challenging to cross the road and anticipate traffic movements. They can sometimes be slower than able-bodied pedestrians, so give them time and be patient. If a vehicle pulls out in front of you at a junction, causing you to brake, don’t admonish the driver – keep calm and don’t retaliate. If you were looking far enough ahead and anticipating traffic you would have seen this was a possibility and you would have more time to react. If you are riding a motorbike then you should ensure your position on the road makes you the most visible and be prepared to use your horn as a warning if you think a driver hasn’t seen you. Your horn should only be used to alert other drivers, not to reprimand them, and not in a built-up area between 11:30pm and 7am. You mustn’t use your horn when you are stationary unless another moving vehicle poses a danger to you. If they pulled into your lane, simply drop back and increase the buffer. If it really upset you, find a safe place to stop and wait until you’ve calmed down before you drive again. If you approach an unmarked crossroads slow down and be extra-cautious, especially when your view is restricted by hedges, bushes, walls and large vehicles etc. In the summer months these junctions can become more difficult to deal with when growing foliage may obscure your view. On a one-way street, if you want to turn right you should position yourself on the right of the road, but be extra cautious if you are turning into a two-way street – don’t turn onto the right-hand side of that street. When you plan a route for your journey, plan a contingency route in case your main route is blocked or traffic is unexpectedly heavy, and make sure you give yourself enough time for the journey, particularly if it’s a long trip. This is because you will need to take regular stops, and the longer your trip the more likely it is that you will come across something unexpected such as a traffic jam. Tailgating is where you follow another vehicle too closely and it increases your risk of having an accident. Following a heavy vehicle too closely means that you can’t see around the vehicle and it can’t see you in its mirrors – particularly dangerous for motorbike riders. If the vehicle in front stops then you will have reaction time plus braking time and if you are less than two seconds behind it, you risk running into the back of it. This is called the two-second rule and it has the mnemonic ‘only a fool breaks the two-second rule’. If it is wet, visibility is less, or you are towing a trailer, increase this to 4 seconds. There are fines for tailgating. Read more about it here. Avoid blocking side streets and junctions. For example, if you are approaching a green traffic light and going straight on, but traffic just beyond the junction is queuing, wait until you have enough room the other side of the junction before proceeding across. This is especially important if you have a long vehicle that could block a large part of the junction – remember that you will need more space the other side. In rural areas you should avoid parking on the verge because you may drag mud onto the road. In very wet, slippery conditions, if the verge is sloped you might find it impossible to get your vehicle back on the road, and you could also damage the verge with the weight of your vehicle. in a disabled space without a blue badge. Outside schools you will see painted zigzag markings such as this one advising you that you cannot park there. Use dipped headlights when you are driving around other traffic (i.e. following other vehicles or driving other vehicles), if a police officer is directing traffic, or if you are parked. You can use main or full beam headlights when there are no other vehicles around. Motorcycles should always use at least a dipped headlight if they don’t have daytime running lights. You can tell if your main beam headlights are on if you see this symbol illuminated on your dashboard. You should only flash your headlights at other users to let them know that you are there. If a bus has stopped ahead of you and its right indicator is flashing you should slow down and give way if it’s safe to do so. Look out for people leaving the bus and crossing the road without looking. They may run out from behind the bus. Also look out for people running to catch a bus who may be more concerned about catching it than watching for traffic. 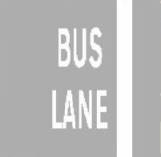 If a bus lane shows no times of operation then it is in operation 24 hours per day. Don’t drive or park in a bus lane when it’s in operation. This can cause disruption to traffic and delays to public transport. If you are caught you could be fined. Cyclists and taxis are most likely to share a bus lane with buses. Heavy vehicles need extra room and time to turn because they have longer wheelbases and a higher centre of gravity. 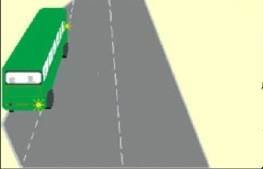 If you see a lorry or bus pull out to the right but they have their indicator indicating left don’t overtake them on the left because they are swinging out to clear the corner and they will turn across in front of you. If you are driving a lorry or bus be careful of cyclists in your blind spot when turning left. If you are being followed by an emergency services vehicle you must pull over and let them pass. If a police officer is following you and wants you to stop they will indicate this to you by flashing their lights and signalling with their left indicator. Find a safe place to pull over. A green flashing beacon or light on a vehicle is a doctor on an emergency call. If you are being followed by an ambulance showing a blue flashing beacon you should pull over to the left as soon as possible to let it past. Bomb disposal, coast guard, blood transfusion and police patrol vehicles also use blue flashing beacons. Yellow flashing beacons are used by service vehicles and disabled drivers and you don’t need to pull over for them, but you should give way to them if required. If you are coming up to a junction and an emergency vehicle with its lights flashing is waiting to exit, slow gently and let it emerge. At a pelican crossing the flashing amber light means you must give way to pedestrians already on the crossing. Pelican crossings are signal-controlled crossings operated by pedestrians. Pushbutton controls change the signals. Pelican crossings have no red-and-amber stage before green. Instead, they have a flashing amber light, which means you must give way to pedestrians already on the crossing, but if it is clear, you may continue. You shouldn’t encourage pedestrians to cross by waving, beckoning pedestrians across or flashing your headlights as other road users might misunderstand you. Also, don’t harass pedestrians by creeping forward or revving your engine. Puffin crossings have infra-red sensors which detect when pedestrians are crossing and hold the red traffic signal until the crossing is clear. The use of a sensor means there is no flashing amber phase as there is with a pelican crossing. A steady amber light follows the green light. The video below shows how to cross at a puffin crossing. Cyclists are allowed to ride with pedestrians on toucan crossings. If you are approaching a zebra crossing look out on the approach especially for children and older pedestrians. They may walk across without looking. Zebra crossings have flashing amber (Belisha) beacons on both sides of the road, black and white stripes on the crossing and white zigzag markings on both sides of the crossing. Where you can see pedestrians waiting to cross, slow down and prepare to stop. If it’s a school crossing they will signal you to stop by displaying a ‘STOP’ sign. There are many places where you should not park: it’s important to make sure that you always select a place that is both safe and legal. Parking on or too close to a pedestrian crossing can be dangerous as this will restrict the view for drivers and pedestrians, especially if you have a large, long vehicle. Read the full guide on pedestrian crossings here. Class 3 power vehicles (a powered wheelchair) are battery powered and very vulnerable due to their slow speed, small size and low height. Some are designed for pavement and road use and have a maximum speed of 8 mph (12 km/h). Others are for pavement use only and are restricted to 4 mph (6 km/h). Take extra care and be patient if you are following one. Allow plenty of room when overtaking and do not go past unless you can do so safely. Diesel fuel and oil spilled on the road becomes very slippery and is a real hazard to all vehicles, especially motorbikes. When you have refuelled make sure your filler cap is tight. If you are attending a social event the best precaution to take is to not drink alcohol at all. Any consumption of alcohol negatively affects your reactions and perception. you can always take public transport or a taxi home, or get a sober driver to drive you. If you have drunk alcohol be aware that your body will only process a maximum of one unit per hour, so you could easily be over the limit and unfit to drive after you have slept, i.e. the next morning. Find out about drink driving limits here. Alcohol will reduce your reaction times, increase your confidence, make your judgement worse, and give you less control over your vehicle. If you persistently use drugs or alcohol when driving you risk having your licence taken away from you. Speed limits vary by road and vehicle type, and there may be variable speed limits at times to try to keep vehicles moving as smoothly as possible. On motorways and dual carriageways the maximum speed limit is 70mph. However, on narrow residential streets the speed limit may be as low as 20mph. If there are no speed limit signs on the road a 30mph limit is indicated by the presence of street lighting. If you are towing a caravan your speed limit is 60mph on a dual carriageway. All the current speed limits are listed here. Think you’d pass all the attitude questions in the theory test? Have a go by clicking here.